Style: Poop.Material: Polyester & Cotton. Suit for Christmas, Home, Hotel, Decorative, Chair, Bedding. 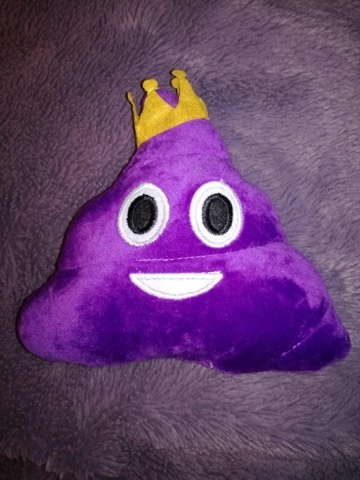 This funny poo shape pillow is a good gift for friends,children,home decoration decor and so on. This is described in the listing as a cushion, but it's only 20cm in size so it's more like a mini cushion or soft toy really. It's still good value for the price though as it's well made and is a great design. It comes in several different colours and designs. We opted for the purple one with a crown, as it's my daughters favourite colour. She's very happy with it, she says it's cute - although how a poop can be described as cute I don't know lol! It would make a great, inexpensive stocking filler that any emoji fan would be happy to receive. Although this came from overseas, it arrived very quickly. It was here in just over a week, which was fantastic service. Great product + great customer service = five stars!